During the 1970s, a small number of tough-minded young people moved into what is now the Yukon-Charley Rivers National Preserve. They built cabins, trapped, fished, hunted and raised sled-dogs — living a version of the Alaskan dream that would soon become a thing of the past. The third section of John McPhee’s book, “Coming into the Country,” profiles many of these people, living a life only the Alaskan frontier could offer. One of those profiles is the beginning of a love story. It was first written in a journal in 1975, tacked to the wall of an empty cabin and left in one of the wildest parts of Alaska. “Monday, November 10th. Minus 12 degrees. Cloudy and may snow. Today is the anniversary of being in Alaska for exactly one year now,” the journal read. Corazza said that sums it up. It’s been 40 years since these words ended up in the pages of “Coming into the Country.” Even though he gave McPhee permission to publish the journal, Corazza is still a little shy about it. “I was kind of shocked that he wrote the love story part of it, of all the things he could have written about it,” Corazza said. It’s a bit awkward to talk about today, because as he’s reading from his old journal, Rich is next to the woman he’s spent his life with — and her name is not Sara. It’s Sonja. “Sonja was the first girl I met in Alaska,” Corazza said. “But, we weren’t at all impressed with each other,” Sonja Woodman-Corazza responded. At the time, Woodman-Corazza was also living in the upper Yukon. She was born on Alaska’s Kenai Peninsula and grew up fishing. But she was also drawn to the bush, and in 1975 she was living with a friend in a cabin about 40 miles from Corazza. The two kept running into each other — and helping each other out. As Corazza and Woodman-Corazza taught each other survival skills, they discovered they shared a deep love for the land. The two were discussing marriage when Corazza’s journal pining for Sara appeared in the pages of “Coming into the Country,” first published in one of the most famous magazines in America, The New Yorker. Of course, Corazza did choose the “fishing woman from Alaska,” and they’ve been together ever since. Today, the couple is living on a bluff overlooking Homer, in a cozy log home Corazza built himself, on land Corazza-Woodman’s grandparents homesteaded. Corazza and Woodman-Corazza had moved off the Yukon by then, but they were close with many people who left. It’s not easy for Corazza to talk about. “It was uncalled for for people that weren’t Alaskan to come in here and change this country to their standards without considering the people who were on the land. Hard to understand when you’re a young kid,” Corazza said. Sonja also gets emotional talking about how the Yukon changed when the area became a National Preserve. She said it’s important to protect the environment, but the people who lived there were important, too. Corazza said young people no longer experience Alaska like he did in 1975. They arrive here with hiking boots, bikes and skis, and see the state as a kind of picturesque playground. But Rich has a different vision. He said there’s no longer a place for a young person with no money to go build a cabin out in the woods. 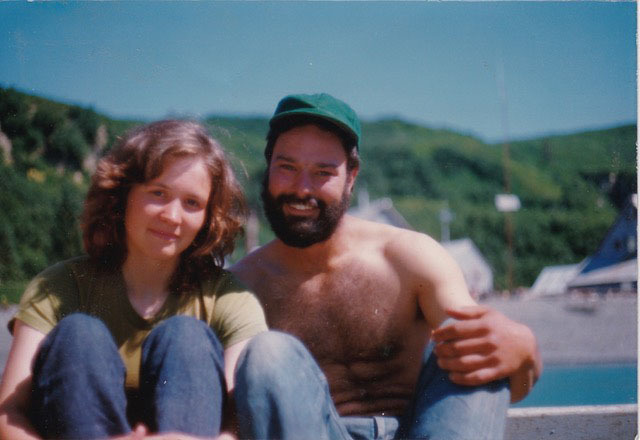 In the end, McPhee may have publicized Corazza’s love notes to a girl he didn’t end up marrying, but Corazza said that’s okay because McPhee so perfectly captures his other great love — a time and place in Alaska that felt truly boundless.